One of the basic assumptions of cosmology is that the Universe is basically the same everywhere. That is, our location in the cosmos isn’t special, and if we happened to be located in another corner of the galaxy we’d see basically the same thing. It’s sometimes known as the Copernican principle, since it was Copernicus who famously proposed the Earth was not the center of the Universe. But given that we haven’t traveled very far into space, how can we really know that assumption is valid? The usual condition for the Copernican principle is that the Universe is homogeneous (meaning that on large scales matter should be evenly distributed) and isotropic (meaning that there is no special direction or orientation in the cosmos). The first can be seen by observing the distribution of galaxies in the visible universe. On small scales galaxies are clumped into cluster and superclusters, but at increasingly large scales things even out. We also know that the laws of physics seem to be the same throughout the cosmos, which supports the idea of homogeneity. But what about the directionality of the Universe? To be isotropic, all directions have to be equivalent. This means, for example, that the Universe as a whole can’t be rotating. If there was a cosmic rotation, then the axis of rotation would be a preferred direction. It also means that the Universe can’t be expanding more quickly in one direction, since that would give the Universe a specific orientation. These aren’t simply hypothetical constraints. As Kurt Gödel demonstrated in 1949, general relativity does allow for a rotating universe, and several models of cosmic expansion have proposed that it might vary for different regions of space. If it does turn out the Universe isn’t isotropic, then our current model of the Universe would be overturned. One of the best ways to test isotropy is to look at the cosmic microwave background (CMB). Since the CMB is the most distant source of light, any rotation or preferred expansion would be seen as deviations from isotropy within the CMB. Previous studies such as that of the Planck spacecraft have found no evidence of any deviations, but a new study takes things one step further. It looked at everything from the distribution of hot and cold regions within the cosmic background to the polarization of CMB light (what’s known as vorticity). 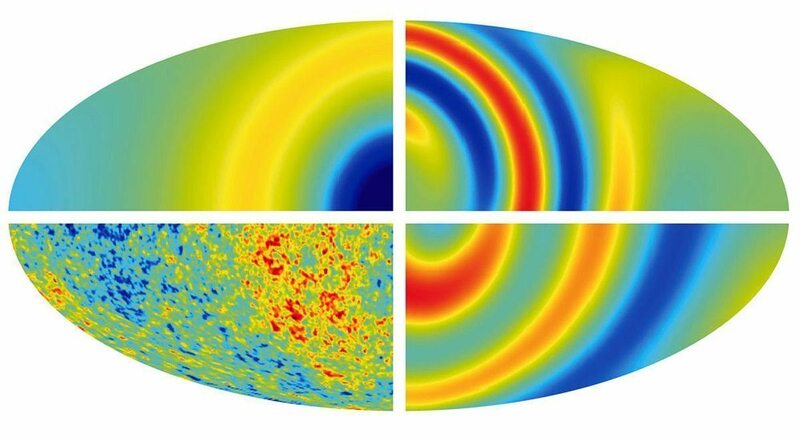 The study found the CMB is isotropic to the limits of the data. Specifically they found the odds of a preferred direction in cosmic expansion to be 121,000 to 1 against. This is good news for supporters of the standard model, as still theoretical models such as early cosmic inflation. There might still be some small anisotropy within the Universe, but as far as we can tell Copernican principle holds. For now, cosmology continues to lack a sense of direction. I miss that isn’t pointed that the measured CMB is isotropic once subtracted the dipole moment that’s explained away… for reasons not all readers may know. Right, the raw data shows our relative motion in regard to the CMB. For readers who aren’t familiar, I’ve written about that before. If i were a betting man; my money would be on a rotating Universe. Or, to put another way, what is the source of all the angular momentum observed within the Universe?